Sam Fisher wants revenge, y'all. By the looks of things, he will get it, and you'll be there to orchestrate what looks to be a very satisfying mission to find his daughter's killer and exact sweet retribution. 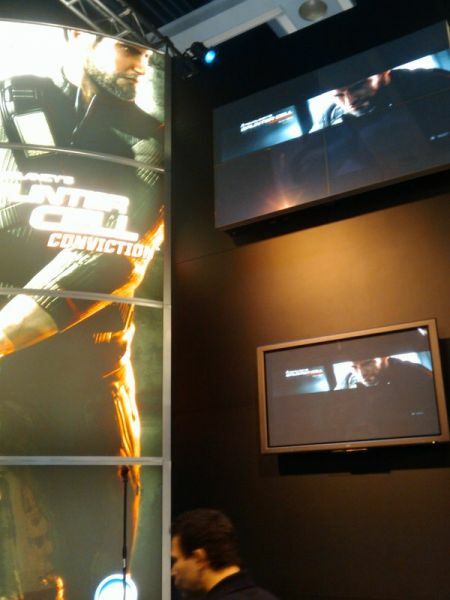 The Splinter Cell: Conviction live demo was delayed due to technical errors, but when the floor team finally had it going, it was worth seeing. At first, it seemed to be the same demo that was shown at E3 this year, but upon closer examination, the mechanics have received a small boost, adding that much more excitement to an already interesting title. If you've been following this game since its revamp at the beginning of 2009, you might remember the "Mark and Execute" feature that allowed you to scope out each area before entering, and mark each target. You can then enter and eliminate the targets with ease, your aim snapping to each one in the sequence that you've already chosen. This can apply to lights, enemies, and other appropriate objects. "Mark and Execute" doesn't always work out, though: it's not perfect. Your line of sight may be affected in ways that you didn't consider, an enemy may juke without warning, or your own itchy trigger finger may snap off a round before you were supposed to shoot. In these cases, you can step in for a close takedown, or retreat into the shadows for a second chance at a cleaner kill. A new function that was shown for the first time today that assists you in this is the "Last Known Position" -- certain objects in the environment (in this demo, it was a statue below the patio) will be outlined in a ghostly white hue, indicating the area of interest that the AI will examine. This is your last known position before you disappeared, hence the name. You can use this to determine where the AI will be attracted to, and you can summarily finish the job. When you're hidden from the AI, you will no longer see a light meter in your HUD: the screen will become desaturated, except for enemies and focal points of the room. This serves not only the purpose of informing you of your alert status, but also to guide you to the objective. Patience is a virtue in Splinter Cell: Conviction. The sounds of the game were very sharp, very vicious. The silenced pistol is harsh-sounding -- as it should be -- and your empty cartridges tinker on the floor. Bones snap, glass shatters...it's all here, and it's great stuff. It goes hand-in-hand with the truly wince-worthy executions and attacks that you pull off as the Splinter Cell. Finally, the only thing that I took as a negative note: the story looks really great as usual, but will be partially told by flashbacks that take place during the gameplay. These reminded me of the Cortana visions from Halo 3, which were frikkin' annoying. I hope they're skippable...in which case, Splinter Cell: Conviction will be an awesome game. Co-op note: I asked about co-op, and the official response is, "We're not announcing anything about multiplayer yet." Ubisoft reps did confirm multiplayer, but said that the official announcement and details will come at the Tokyo Game Show later this year. Page created in 0.6327 seconds.